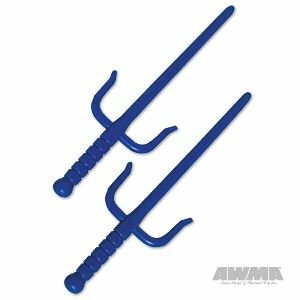 Octagon Chrome Sai - 19-1/2"
The BladesUSA 2309C Octagon Metal Martial Arts Sai set features two octagon sai knives that each measure 15 inches. They're made from high-quality, super tough solid steel and have a mirror shine finish. 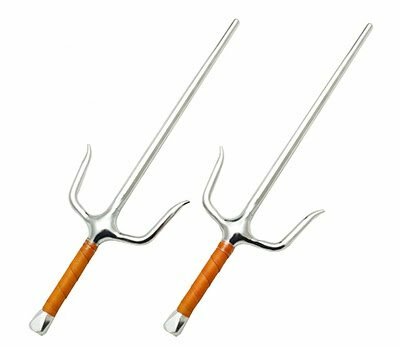 Ideal for for collections, cosplay, or LARP, they have no sharp edges. The handles feature a golden leather wrapping to add an Oriental flare. A letter opener fit for an Assassin! this ~6 inch long replica sai can pull double duty as a unique hair stick. Made of stainless steel and polished to a high sheen this sai will not tarnish. This Sai Set is 18" and comes in a 2 pc. set. 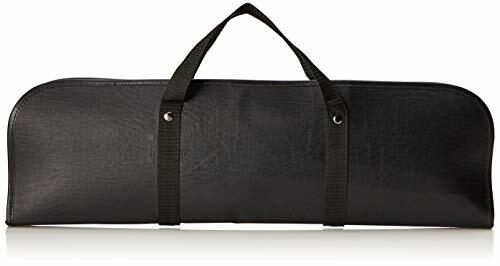 The set features leather wrapped handles and octagon stems. The Sai is a Okinawan weapon. The sai was a simple farm instrument which the peasants turned to their advantage once they were forbidden to carry any arms. Today the sai is blunted and rounded at the edges and is no longer used as a weapon for mortal combat. 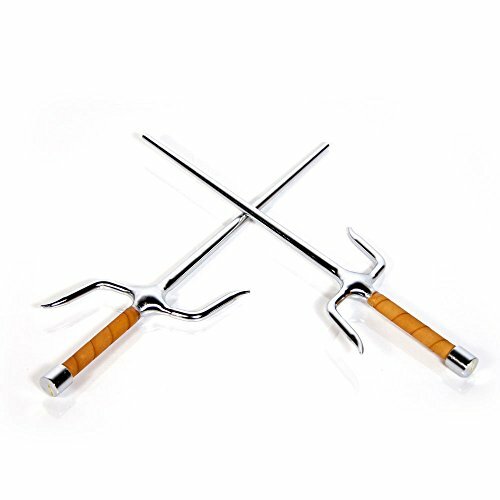 These beautiful and durable Sai are excellent for competitions or for daily training. They are made of forged steel and feature Leather wrapped handles and come in your choice of Chrome or Black finish. 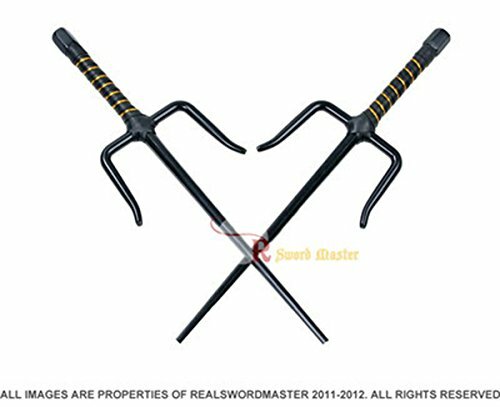 These beautiful and durable Sai are excellent for competitions or for daily training. 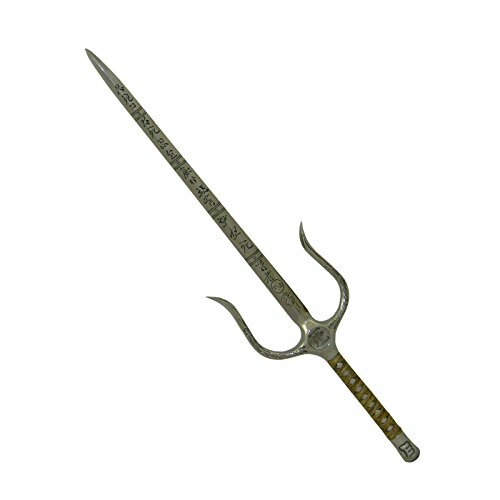 The OCTAGON in the product name refers to their cylindrical shape of the blade with a cylindrical end at the handle tip. 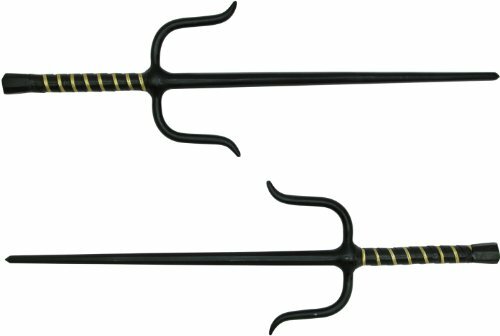 Sold in pairs of 2 Sai and available in 4 lengths. Don't forget to add our sai case (found on this site) to keep your Sai in pristine condition. The Superdo forging high quality octagonal metal Sai, nickel finish, antiskid, damping rubber bandage handle. 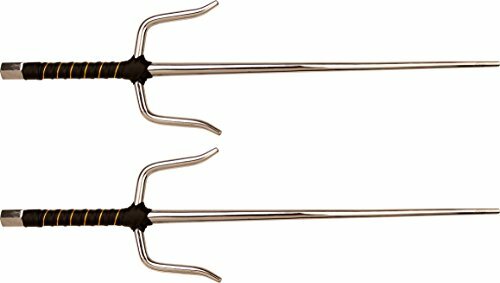 These Sai are perfect for students just starting with the Sai or anyone wanting to perfect their technique while reducing the chance of injury. Sold in pairs of 2 Sai. 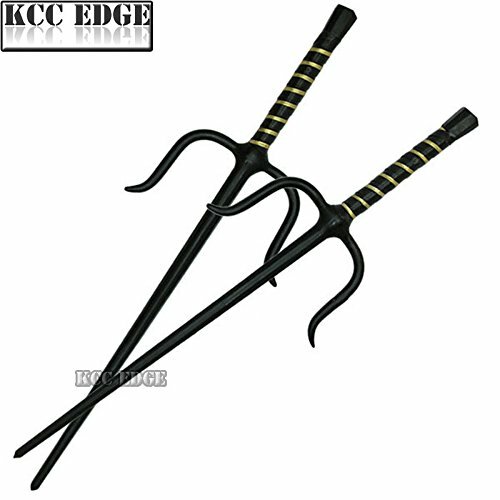 Set of 2 19" Black Octagon Stainless Sai Karate Practice New. The blade of the Sai are stainless steel with a hexagonal design. The tip of the Sai is unsharpened. The blades feature a blacked out design. One piece molded plastic sai. 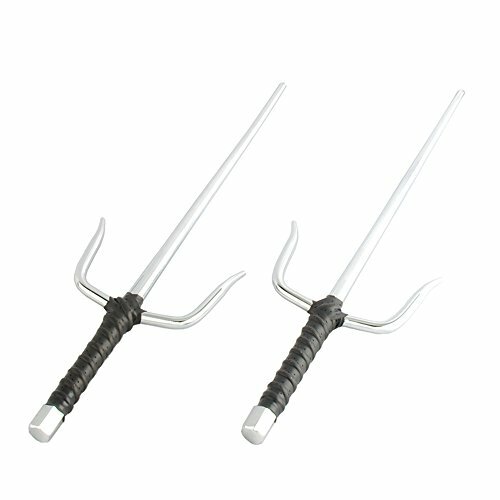 Lightweight and ideal for beginners practicing striking and counter techniques. Traditional round stem and handles for a sure grip. Measures 12-1/2" long. Traditional round stem and handles for a sure grip. 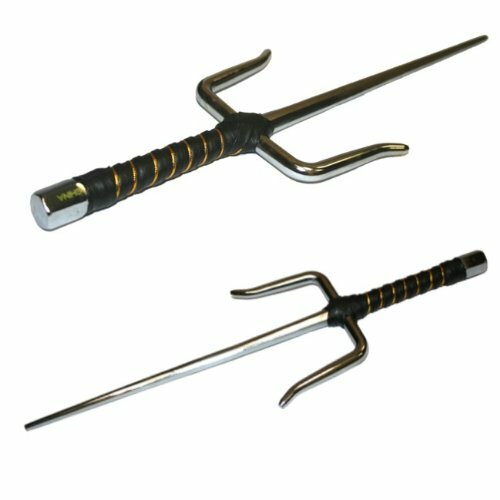 Lightweight and ideal for beginners practicing striking and counter techniques. Sai- (pronounced sigh) The sai was developed for planting rice or vegetable seeds. 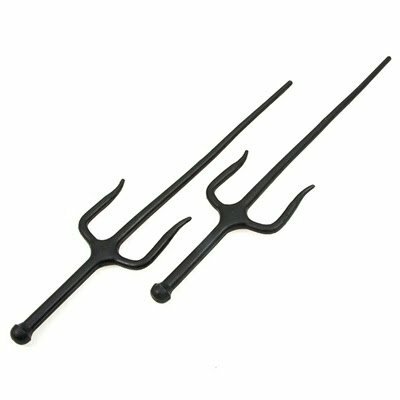 It resembles a trident (three-pronged fork or weapon) and has central, rounded or octagonal shaped steel blade approximately 13 inches long. On either side of the blade there are two prongs that are wrist guards. Sais can be used for a number of things such as stabbing, slashing, punching, blocking, and even throwing. It is believed that farmers who used the sai would carry three at a time. One sai for each hand and one was kept in the belt to throw if necessary. Legend states a strap of some sort was occasionally tied to the handle so the farmer could retrieve it. The origins of the Sai are a mystery even today. It is known that the weapon was most popular in Okinawa and probably was originally a farming tool. What is not a mystery is the effectivness of the Sai. 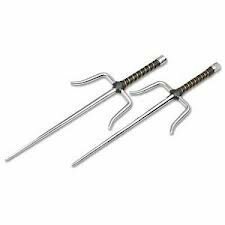 The most well known abitlity of the Sai is its defense against edged weapons. The three pronged design catches a blade and a twist of the wrist will break the blade. Additionally the weapon is can be thrown up to 30 ft, punch through armor, pummel an opponent, and be used leathally an non lethally. Typically the Sai was carried in a set of two at the hip and an additional Sai at the back of the belt. Despite popluar belief the Sai was unsharpened and had no edge. Bishamon is the Japanese Kami (or God) of war and evil. He is the patron of the warriors of Japan as well as the punisher of the evil. He is one of the Seven Gods of Fortune, according to Shinto belief. He is also one of the Four Guardian Gods protecting one of the Cardinal points, the North. According to legend he was called upon and came to the Prince Shotoku in 587 during the anti-Buddhist clans of Japan. This is a Combo Set comes with Sai & the holder!! The Sai are inserted into the top of the Kami's head and tips come out through the mouth. The mask is easily mounted with a single steel hanger similar to a picture. Huub Skull Cap The HUUB Premium Neoprene Skull Swim Cap is a fully adjustable swim hat. It has an adjustable strap for extra comfort when swimming in open water. Constructed using a high-grade neoprene, the Huub Skull Cap is designed to ensure comfort and warmth. Dubbed the most comfortable swim cap on the market, this neoprene cap sits comfortably against the head and ears to keep you warm in open water swims. The thick neoprene construction ensures added warmth in any cold water swim so you can continue with strength and speed. Completing the neoprene skull cap is a chin strap which can be adjusted to ensure a perfect fit. Neoprene - Ensures all day comfort. Thermal Properties - Keeps you warm on cold swims. Chin Strap - Can be adjusted to provide an optimum fit.